How do you prefer your banana pudding? When I was pregnant with The Kid, we went up to New Jersey for what turned out to be a surprise baby shower. The festivities were a bacchanal of Jersey-Italian party food. Meatball and sausage sandwiches, enough potato and macaroni salad to fill a box car, and cake adorned my aunt’s groaning dining room table. Evidently, whipped cream is a desired cake topping for some benighted folk up there. But I am a member of team buttercream. Frosting’s one of my favorite foods. Unfortunately, whipped cream was ordered. Because my pregnancy hormones had already caused me to cry once that day, I used every ounce of my gestationally-frayed self-control and refrained from sobbing in disappointment. But I ate no cake at my own baby shower. You know what, though? I think I’m good on the whole whipped cream thing. I mean, considering this possible alternative. My whipped cream cake was just white with plastic babies on it–not in it. But on banana pudding, I choose whipped cream. Because I really dislike meringue. I get weekly emails from McCormick Spice Company. The latest one had a recipe for meringue cookies. I studied it. On this recipe, and every other I’ve ever seen, there are dire warnings to never attempt making meringue on rainy or humid days. It was pouring out, but I had a theory. My theory was that modern homes are built so air-tight that they cut down humidity to negligible levels. As a purely scientific experiment (certainly not to eat), I’d create meringues. Starting with the recipe they supplied, I changed it up a bit, and went to work. Preheat oven to 225, and line 2 cookie sheets with parchment paper. Place egg whites into bowl of stand mixer. Beat on medium until they lighten in color and begin to increase in size. Slowly add cream of tartar. When they turn white, slowly add sugar a tablespoon at a time. When added scrape down sides of bowl. Turn mixer back on. Running on high, slowly add salt, then vanilla. Beat until glossy, and stiff peaks form. Use large pastry tip fitted on zip-top bag (or, if you don’t have a pastry tip, cut about 1/2 inch off one corner of bag). Fill with meringue and pipe onto parchment paper into circles of 2 inches wide. Place both oven racks close to center and put one cookie sheet on each rack. Bake for 30 minutes then rotate sheets. Bake for 30minutes more. Turn off oven and let meringues sit in oven for one hour. Because they’ll absorb moisture from the air and get soft, store them in airtight container. You can re-crisp them in a 225 oven for 15-20 minutes, but they’ll never be as perfect as when fresh. Makes 30 cookies. They take flavor easily, so play with extracts. Mocha, for instance; add 2 tablespoons of cocoa with the sugar, use coffee instead of vanilla. So, my theory proved correct. They turned out crispy, and to my huge surprise, crazy yummy. They’re also only 26 calories apiece and both gluten and fat-free. 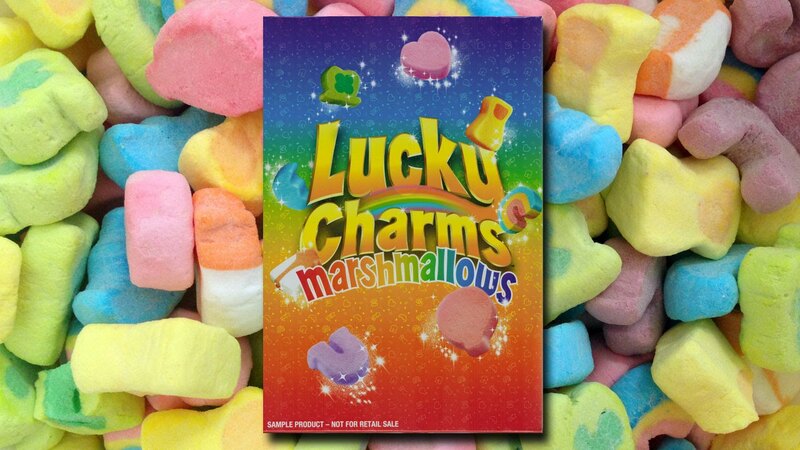 The best part is these addictive little treats are very much like marshmallows in Lucky Charms. My whole life I’ve wished for a box that somehow slipped through quality control, and held no cereal, but was filled solely with marshmallows. It does exist. If this is true, who knows what else is real? Maybe Pauly Shore is funny, and Kanye is talented. Now when I get that feeling, I can, in twenty minutes, turn out a pan of homemade ones the size of hockey pucks.